Dr. Byron W. Wall has been helping patients throughout Albuquerque with diverse dental care needs. This means offering cosmetic dental care to deal with smile aesthetics and restorative dentistry treatments that enhance dental health and total wellness. Sometimes the ideal treatment options involve prevention and protection, which is why mouth guards may be a great idea for certain patients. Mouth guards are protective retainers that are worn in order to protect the teeth and/or the tongue from serious injury, stress, and other kinds of potential damage. These mouth guards are ideal for many different people and for various kinds of conditions. Professional athletes, student athletes, sports amateurs/hobbyists, and weekend warriors are great candidates for mouth guards. When an athletic mouth guard is in place, the person wearing it can rest assured that their teeth and their tongue are protected from serious injuries that may result from physical contact or accidental slips and falls while playing and competing. Teeth grinding is a condition that occurs when a person clenches, gnashes, or shifts their teeth while asleep. Over time, the stress on the teeth can lead to soreness as well as damage to the tooth structure (i.e., chips and cracks). People who suffer from bruxism are excellent candidates for protective mouth guards. Generally this means the use of a bite guard/night guard while they sleep. This protective mouth guard prevents direct contact between the upper teeth and the lower teeth as a patient sleeps. This means less likelihood of tooth damage as well as reduced stress on the jaw joint. 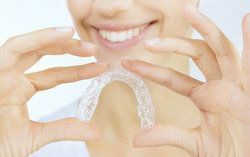 Typically, the mouth guard is just part of the teeth grinding treatment process, which often includes orthodontic care, restorative work, and stress management. Given all of the motions that the jaw joint has to make when a person is eating, speaking, and simply making facial expressions, the jaw joint remains one of the most complicated joints in the human body. It's referred to as the temporomandibular joint, or TMJ. A TMJ disorder refers to clicking, locking, and popping of the jaw joint, which can be the result of problems that affect the bone, cartilage, nerves, muscles, or a combination of all such parts of the jaw joint. Teeth grinding is often a cause or contributing factor to TMJ disorders. Mouth guards become part of the treatment process for TMJ disorders since they help reduce stress on the jaw joint during sleep. This is preferable to more advanced treatments for TMJ disorders when possible since the mouth guard is noninvasive and quite effective at addressing symptoms of the condition. Is getting a custom mouth guard worth it? Custom mouth guards are issued for the treatment of teeth grinding and TMJ disorders, and custom mouth guards can be crafted for athletes as well. The extra comfort of a custom mouth guard can mean a major difference if you're competing to win. For more information about mouth guards and how they can benefit you, be sure to contact our cosmetic and restorative dentistry center today. Dr. Wall and the entire team at the practice look forward to your visit and helping you achieve all of your aesthetic goals.